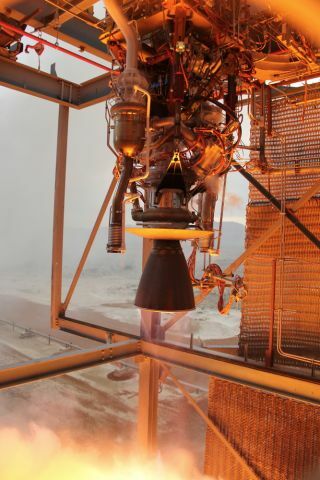 Blue Origin's BE-3 rocket engine undergoes acceptance testing, generating its maximum 110,000-lbs of thrust, at the company’s facility in West Texas. Blue Origin, the secretive private spaceflight company founded by Amazon CEO Jeff Bezos, will begin suborbital flight tests this year of an innovative new spaceship — a milestone made possible by the firm's rocket engine success. Blue Origin president Rob Meyerson told reporters today (April 7) that the company will fly unmanned suborbital tests of its New Shepard spacecraft later in 2015. The shakedown cruises are aimed at testing the performance and reusability of the commercial launch system's BE-3 rocket engine, which Blue Origin has cleared for suborbital flight. A diagram of Blue Origin's New Shepard spacecraft for commercial spaceflight. The New Shepard spacecraft is designed to launch a crew capsule carrying at least three astronauts or passengers on suborbital flights that reach over 62 miles (100 kilometers) in altitude — the boundary of space, Meyerson said. A reusable booster powered by Blue Origin's BE-3 rocket engine will launch the spacecraft from the company's West Texas proving grounds, and then return to make a land-based landing. Ultimately, Blue Origin aims to fly paying passengers and researchers on round trips to suborbital space, though Meyerson said manned flights on New Shepard are still several years away. First, the spacecraft and its BE-3 engine must pass a rigorous testing regime. "They could go as quickly, in the early days, as on a monthly schedule — a month between tests," Meyerson said. "But we expect over the next couple of years to be flying regularly with the New Shepard vehicle." To achieve a vertical launch and vertical landing for New Shepard, the BE-3 rocket engine is capable of throttling up to 110,000 pounds of thrust, as well as back down to 20,000 pounds of thrust, Meyerson said. The rocket engine is fueled by liquid hydrogen and liquid oxygen propellant and has passed 450 separate tests during its development. Meyerson added that Blue Origin will make the BE-3 engine commercially available for vehicles beyond its own New Shepard, which is named in honor of Alan Shepard, the first American to reach space. The company is also developing an upper-stage variant of the BE-3 engine, called the BE-3U, for use on a future orbital vehicle, he said. Even as Blue Origin moves forward with the BE-3 engine and New Shepard spacecraft, the company is also making progress on its next rocket engine: the BE-4. Jeff Bezos unveiled the BE-4 rocket engine last September during an event that announced a partnership between Blue Origin and the U.S.-based launch provider United Launch Alliance (ULA). Blue Origin is developing the BE-4 engine to power ULA's new rocket, the Next-Generation Launch Vehicle. Meyerson said the first tests of a BE-4 rocket engine should begin in 2016 and be complete by 2017. Since its founding in 2000, Blue Origin has worked so quietly to develop its manned spacecraft technology that it earned a reputation for secrecy while achieving major milestones, such as a stunning 2006 test flight of a prototype vertical-launch and -landing craft. In more recent years, the company's orbital Space Vehicle project was one of several concepts competing under NASA's commercial crew program to fly astronauts to the International Space Station. (The agency selected Boeing and SpaceX space capsules last year) In 2011, Blue Origin reported the loss of a prototype launch vehicle, but followed that in 2012 with the announcement of a successful crew capsule launch escape system test. Meyerson said he feels Blue Origin is doing more these days to keep the public informed on its private spaceflight progress. "I hope you've seen we're being a little more open," Meyerson said. "These are high-risk tests. We're not going to invite the media to those early tests. As we get more experience with the vehicle, there's going to be many opportunities to have people there real-time to watch."